1. Have a defined collection policy. One of the major causes of past-due receivables is that the facility has not defined clearly to its residents/responsible parties and business office staff when the accounts are to be paid. If you are currently “playing it by ear,” and have no consistent guidelines for your business office to follow, you are inviting bad debt. These guidelines should be made clear to both your business office and admissions staff. If you consistently apply your collection policy to every account, you will enjoy a large decrease in past-due accounts. 2. 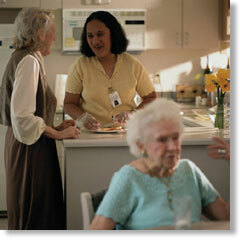 Educate your residents about your payment policy prior to admission. If residents/responsible parties are not educated that their accounts need to be paid on time, chances are they’ll pay late, or sometimes not at all. Make it crystal clear the day of the month that you bill, and when their payment is expected. Let them know the consequences of nonpayment up front, not after they become delinquent. This eliminates potential future misunderstandings with your residents and responsible parties. Restating your payment policy when payment becomes overdue can be a strong first step in facilitating payment. 3. Invoice promptly and bill regularly. If you don’t have a systematic invoicing and billing system, get one. Often the resident/responsible party hasn’t been rebilled or reminded to pay in a timely manner. This situation regularly occurs in facilities with insufficient billing staff in the business office, or if the staff is spread too thin to invoice or bill on a timely basis. The amount of money left uncollected because the resident or responsible party was never billed or contacted a second time is amazing. 4. Keep accurate and timely payment records. Once a resident is admitted, it is vital to maintain accurate and timely records of his/her payment history. If you see any deviation from past payment patterns, and especially if payments become unusually slow, immediate follow-up is warranted. This not only gives you an early alert to impending payment problems, it also gives you the chance for early intervention if there is an unusual event (e.g., responsible party withholding payment, etc.). 5. Contact past-due accounts more frequently. There is no law prohibiting you from contacting a resident/responsible party more than once a month. The old adage “the squeaky wheel gets the grease” has a great deal of merit when it comes to collecting past-due accounts. It is an excellent idea to contact late payers every 14 days. Doing so will enable you to remind the residents/responsible parties diplomatically about your terms of payment and will give you more chances to discover the real reason they are late. 6. Develop a systematic plan to follow up on past-due accounts. Determine ahead of time the actions you will take and a defined time frame for when the actions will take place. For example, at 15-days past due, make a phone call. Your business office can start with a “courtesy call” to make sure that the statement was received. At 30 days, send another statement with the message: “This balance is 30-days past due. Please remit immediately.” At 45 days, your business office can call and make a stronger demand for payment. Having a plan and adhering to it makes both your staff and residents/responsible parties aware that the facility expects to be paid on a timely basis. 7. Use your aging report, not your “feelings.” Many well-meaning business offices have let an account age beyond the point of ever being collected because they “felt” that the resident/responsible party would eventually pay. While there certainly are a few isolated cases of unusual payment situations, the truth is that if you aren’t being paid, usually someone else is. So stick to your systematic follow-up plan. You’ll soon know who intends to really pay and who doesn’t. You can then take appropriate measures once you know where you stand. 8. Make sure your business office employees are trained. Even experienced business office members can sometimes become jaded when dealing with debtors. This usually occurs when the residents/responsible parties have made and broken promises for payment, did not file eligibility information at the county office, avoided your attempts to make contact, moved with no forwarding address, or just flat-out declared that they have no intention of paying. Make sure your business office is firm, yet courteous, when dealing with residents/responsible parties. Your business-office staff could benefit from customer service training, because they must “sell” the residents/responsible parties on the idea that you expect to be paid. Make sure that your business office is trained not only to bring the account current, but also to maintain goodwill with your residents/responsible parties. 9. Admit and correct any mistakes on your part. Sometimes residents/responsible parties don’t pay because they feel you have made a mistake. If the basis of the nonpayment is a dispute over the quality of care, a mutually agreeable settlement between you and the resident or responsible party should be arrived at promptly. The resident/responsible party may use a minor dispute to withhold substantial payment. Insist that the undisputed portion be paid immediately, indicating that the balance will be negotiated. This will help to collect payment, and to show the resident/responsible party that you are listening to his or her concerns. 10. Use third party intervention sooner. If you have systematically pursued your past-due accounts for 60 to 90 days from the due date, and they remain unpaid, you are being delivered a message. If you have implemented a good collections policy, then you have requested payment four to six times in the form of statements, letters, phone calls, and possibly personal visits. Statistics show, however, that after 90 days the effect of in-house collection efforts wears off by 80%. This means that the time and resources of your business office should be focused within the first 90 days of delinquency, when you have the best chance to collect the past-due balances. From that point on, a third party specializing in collections can motivate a resident/responsible party to pay in ways that you cannot, because of both the perceived and real consequences of dealing with a collection agency or attorney. 11. Remember that nobody collects on every account. Even if you’ve set up and adhered to a specific collection plan, there are always some accounts that will never be collected. By identifying these accounts early, your billing staff will save a great deal of time and money. Even though a few accounts may slip by, you will find that the overall number of slow-paying and nonpaying accounts will greatly diminish – and that’s a victory in itself. Author: Ethan Andrew Kosmin is a long term care accounts receivable specialist that consults on best payment arrangements with residents/responsible parties, choosing a collection agency, and other collections issues.